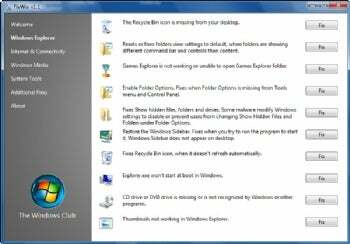 Looking for a fix to a simple problem in Windows Vista or Windows 7? FixWin (free) offers one-click solutions to dozens of Windows problems. Run the program and look through its menu for a description of your woe. When you find it, click a button, and your problem should be fixed. I used it to restore my Internet Explorer icon, for example, and it worked without a hitch. FixWin can fix dozens of simple Windows problems.